This car appears at Rainbow Park on June 23, 1897. 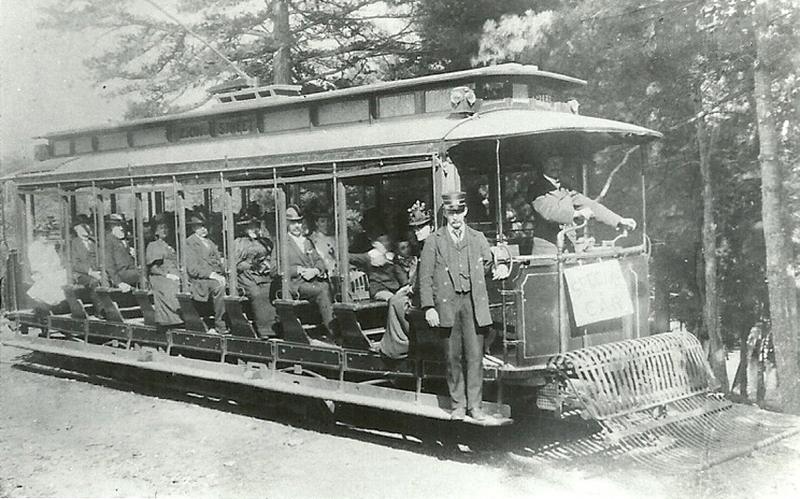 A note on the back of the photograph indicates that this was the first trolley excursion for these people from Newington. Photo and caption courtesy of the Connecticut Trolley Museum. On an early August morning in 1899, four hundred working-class mothers and children boarded trolley cars at Hartford City Hall, destined for a day of fun at Windsor’s Rainbow Park. Although the cars were uncomfortably full on that sultry summer day, the passengers buzzed with excitement about the trip, which they received for free through the Hartford Courant‘s annual Fresh-Air Excursions program. They chattered, laughed, and sang songs to pass the hour-long trip from Hartford to the park 11 miles to the northwest. On the way, the urban families saw market gardens overflowing with produce, animals grazing in fenced pastures, and fields of tobacco nearly ready for harvest. They passed the businesses on Windsor’s Broad Street, turned up Poquonock Avenue, and crossed the Farmington River near Poquonock’s busy textile and paper mills. Their anticipation grew as the trolley entered the village of Rainbow, where the park was located at the terminus of the trolley line. The families entered the park, walking paths shaded by chestnut and maple trees. 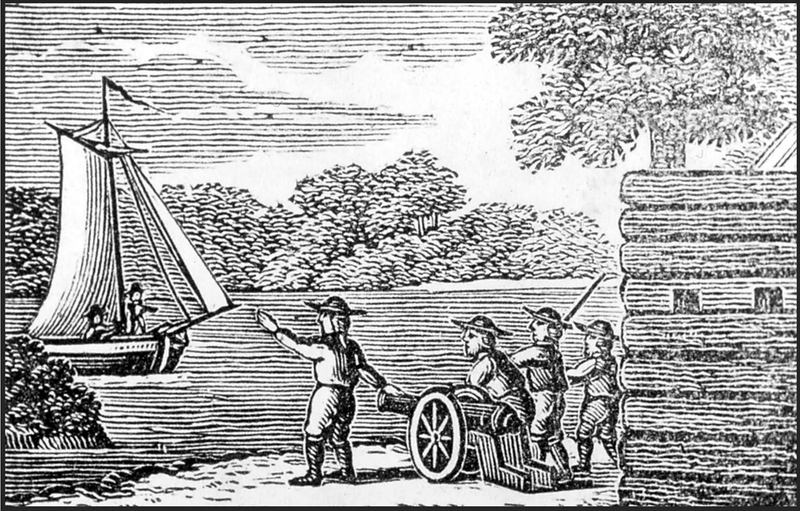 They waded in the Farmington River and took short boat rides. They played on the swings, ate lunch on scattered picnic tables, and danced to orchestra music in the pavilion before returning to Hartford tired but in high spirits. Rainbow Park postcard, early 1900s. 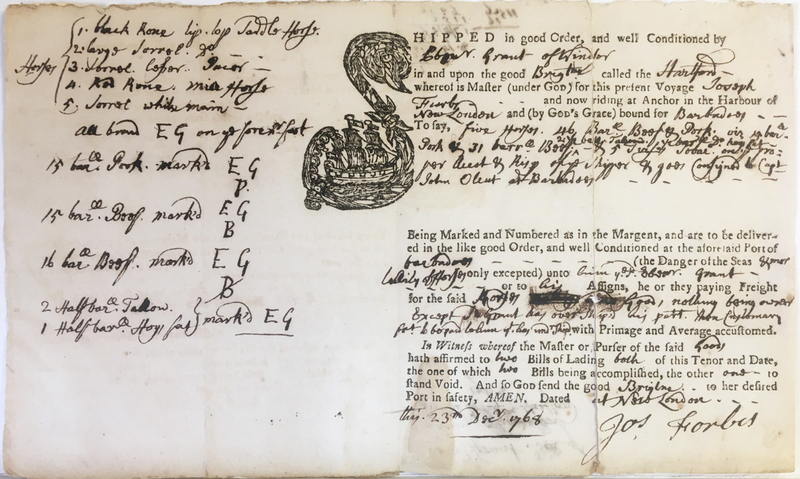 WHS collections 2010.39.64, gift of James Silliman. 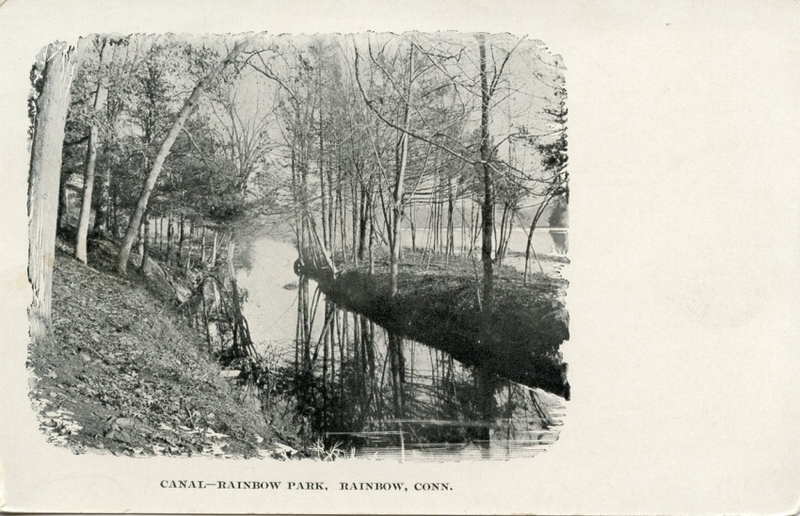 The Hartford Courant‘s Fresh-Air Excursions were one of the many programs, clubs, and organizations that made Rainbow Park an annual destination during the late 1890s. 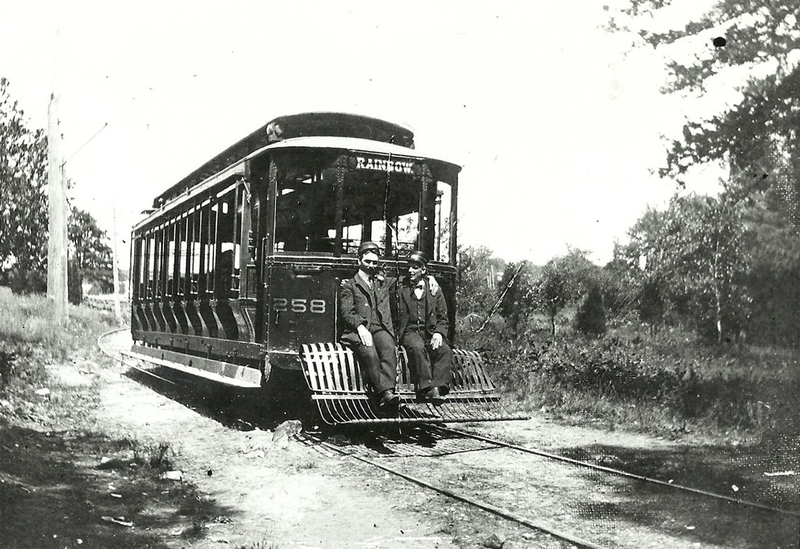 Rainbow businessmen Henry Snow and Samuel Vernon opened the park in 1895, the year the Hartford Street Railway Company completed the trolley line to Rainbow. The park was open daily during the summer with twice-weekly evening dances at the pavilion. Local families and church groups frequented the park, but much of its visitation came from outside Windsor. The trolley company promoted the park as a weekend destination for Hartford families, drumming up ticket sales for a trolley line otherwise used by weekday commuters and shoppers. 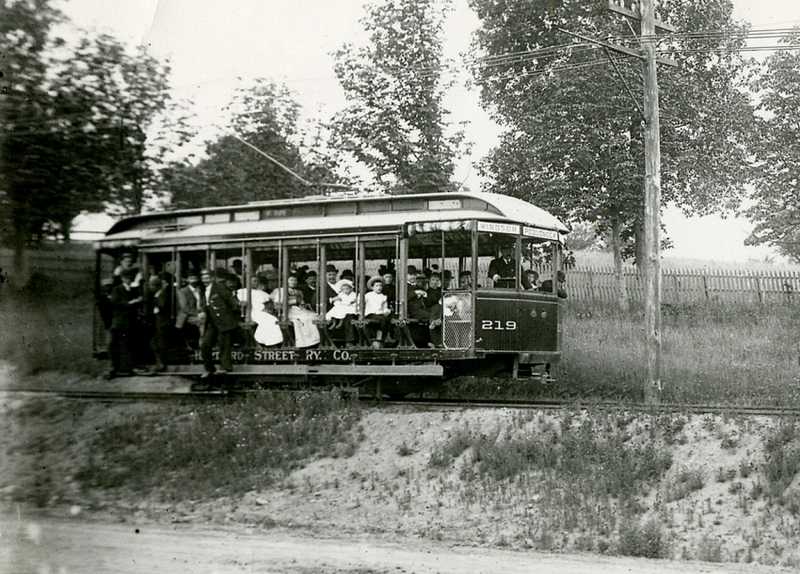 Families aboard the trolley to Rainbow Park, circa 1895-1910. 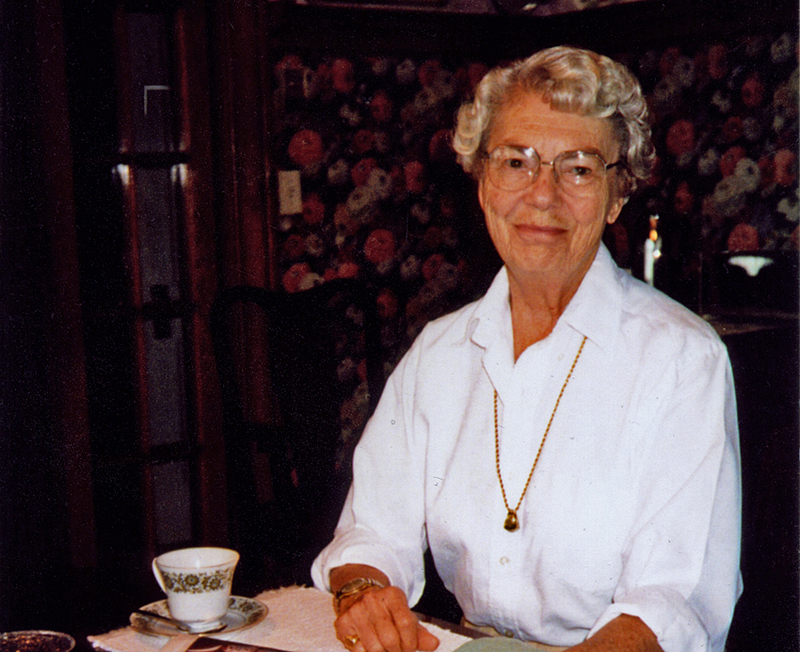 WHS collections 1995.51.2, detail. The crew of Hartford Street Railway No. 258 sits at the end of the Rainbow line in 1905. Photo and caption courtesy of the Connecticut Trolley Museum. Rainbow Park was at its peak when the Fresh-Air Excursions program visited it in 1899, but the park slowly declined over the next 20 years. As more people purchased automobiles, fewer rode the trolleys to work and play. New amusement parks featuring motorized rides also took business away from older parks with fewer attractions. In the early 1920s, the Farmington River Power Company began planning for the Rainbow Dam, a hydroelectric dam that would power the Stanley Works Company of New Britain, CT. The power company purchased the park, and Stanley Works employees were among the last to picnic and dance there. In 1925 the shade trees were cut down, the buildings removed, and parts of the site were flooded as construction began on the dam. The trolley tracks that once transported hundreds of people to the park were used to haul machinery. Like thousands of other end-of-the-trolley-line parks built in the 1890s, Rainbow Park was only a memory by 1930. Images of Rail: Hartford County Trolleys. Connecticut Trolley Museum. Arcadia Publishing, 2005. Kraucunas, John. “Poquonock, Connecticut.” Windsor Storytellers II. Town of Windsor, Connecticut, 2000. Images of Rail: Hartford Trolleys. Connecticut Motor Coach Museum. Arcadia Publishing, 2004.